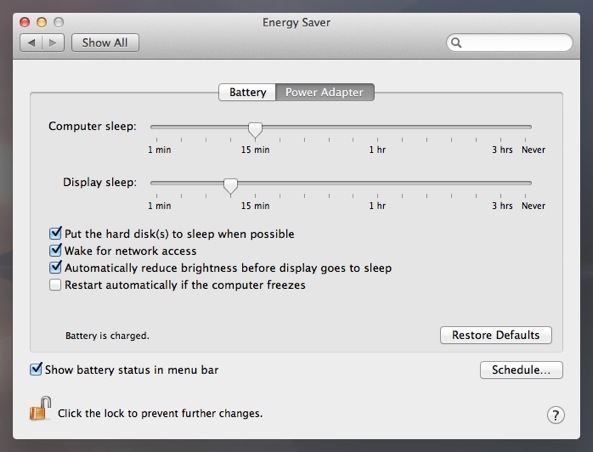 Mac OS X includes the ability to put a Mac to sleep at a scheduled time. 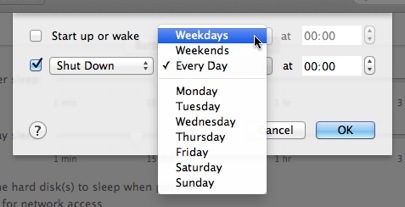 You can also schedule your Mac to shut down or restart at a specific time on certain days of the week. This ability is included as standard with Mac OS X. It has limitations but for many this will be enough to start saving energy. 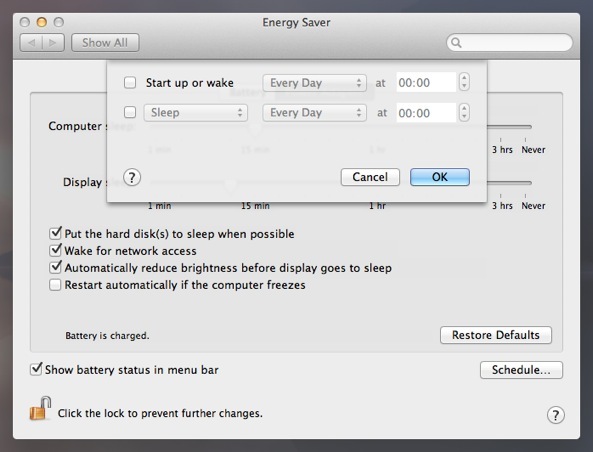 Let's walk through how to schedule your Mac to sleep, shut down, or restart at a specific time. Click on the Schedule… button in the lower-right. Enable the check box next to Sleep to activate the ability. Use the pop-up menus and time to set up your event. Click OK to apply your energy saving event. There are limitations to what can be achieved with Energy Saver's Schedule. The user interface only permits a restricted range of event times and days. If you need more capabilities or want to expand your energy saving schedule, you can turn to the built-in command line tool pmset. pmset exposes more of Mac OS X's capabilities and lets you create more complex schedules. Schedules are still limited in scope, but it offers more than the Energy Saver. If you need more control and capabilities, try our energy saving Power Manager software. This article was posted in Energy saving, and Power Manager and tagged energy saver, and pmset.